Picture if you will. The year is 1988. I sit in school, in Mrs. Dawson’s class, staring out of the window, paying very little to no attention to what is flowing from the afore-mentioned teachers’ mouth, instead he stars across the playground, watching two birds peck away at the remains of another dead bird, when all of a sudden, the classroom doors bang. It’s the caretaker, and behind him he’s pulling the school telly! Of course, it’s a Rumbelows one, on wheels. The class erupts with excitement as she pulls out an ancient VHS tape out of her desk drawer. This will be the only time in the entire school day that the class will have her full undivided attention. “If you’re good, I’ll let you hear the music”, she says, bribing the class into facing the front, as she struggles to get the sun visor across the top of the telly in place, as it collapses hilariously at least once. Of course, we’ll hear the music because Mrs Dawson only knew one button, and that was the Play button. In goes the tape, and she presses play. There they are. For me, the highlight of computer animation at the time. Yes, four spinning ITV logos. We could have been waiting for a programme on making cardboard boxes (to be honest, we probably were), but as long as I got to see (and hear) that, I was content. At the time, we thought that this music and countdown clock was there to help teachers queue the programme up for the class. While this may be partially right, there was also a much more mundane reason. These were the days before the national curriculum, and different areas were allowed to show different programmes, meaning that one region could show a 14-minute programme, and the rest of the country could be watching a 12-minute programme, so for that extra two minutes, the rest of the country will see an extra two minutes of the spinning ITVs while they wait for that region to catch up. On very rare occasions, they would play the full track, if there was an especially long wait between regions. I remember getting this on audio tape, and I played it that much, the tape snapped. The music was surely lost to obscurity. This animation ran every school morning from 1987 until 1993. By then, the national curriculum was fully in place, and eventually there was no need for long breaks between programmes. In 2002, I made a brief post about this animation and a site I’d discovered which had far too much technical detail about this. Sadly, the site no longer exists. However, I did manage to find out who did the music. It was by someone named James Aldenham. Except it wasn’t, because that name was a pseudonym for Brian Bennett, the bloke out of The Shadows. It turns out that both of the pieces of music were released on CD, and due to their rarity, were stupidly expensive. 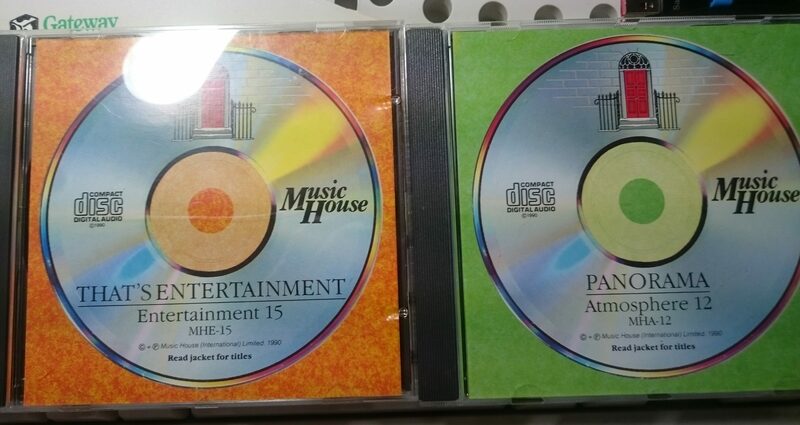 They were on the “Music House” label. And, thanks to eBay, at under a fiver each, I have them both. Another part of my musical journey (pardon the pun) over. EDIT 5/7/17: Here’s a little bit of extra information for those playing along at home. For the entirety of its run, both tracks were only ever aired in mono. During the initial introduction when the schools broadcast started for that day, the first minute of “The Journey” would always be played, before fading out to the clock. This recording was of a fixed length, and the audio was taken from the left channel track, and every other broadcast would be played from the right. The reason for this, is that the left channel had slightly less instrumentation around the intro, so it could be made to sound more “peaceful” to start the day.